Along the east coast of Australia, from Sydney to Cairns, you’ll find a dizzying array of bucket list worthy activities and trips. From climbing atop one of the world’s most recognisable bridges in Sydney, to multi-day sailing trips around the most famous reef in the world in the stunning Whitsundays, this side of Oz will overrun anyone’s itinerary. 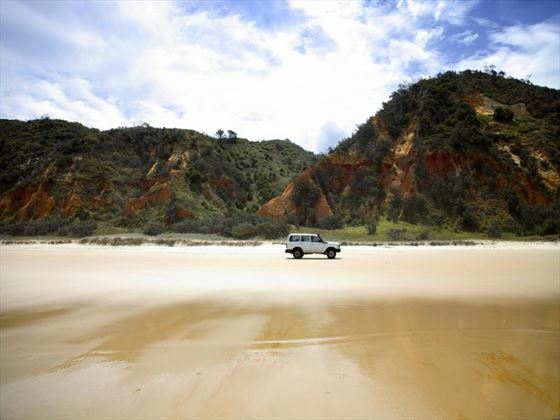 One such trip that is not to be missed is the world-heritage listed Fraser Island. Australia is an incredibly easy country to travel in, albeit incredibly large, but this unique trip is a complete, back to basics adventure. From bumping along the rough ‘roads’ in your hired 4WD to putting another shrimp on the barbie under the stars, Fraser Island is a camper’s paradise. Fraser Island, the largest island on the east coast, is also the world’s largest sand island and the myriad of scenes and terrains to explore is more than enough to fit into a two-week trip, let alone the four day tours people usually take. You will find shipwrecks and you will find towering sand dunes. You will find white sand beaches beside lakes, and fierce white waves beside an empty, wind-swept coastline. You’ll find headlands to hike and sea-water pools to play in.